These terms and conditions (“Conditions”) apply to your Planet Ink Club Membership, the services and products you receive as a Member. They are important so please take the time to read them. A minimum membership period of three (3) months applies. Certain words used in these Conditions have specific meanings. Where they do they appear in bold text. A list of the majority of these words is set out in the definitions section at the end of these Conditions. Others appear in the text of these Conditions. Who is my membership with? Your Planet Ink Club Membership is with Total Care and Support Limited. Total Care is a company registered in England and Wales under Company Number 4454150 and its registered office address is at Time Technology Park, Blackburn Road, Simonstone, Lancashire BB12 7TW. When do these Conditions apply? These Conditions apply as soon as we accept your application for Membership and they apply to your Membership of Total Ink Club and all services you receive and products you purchase as part of your Membership. How do I become a Member and what is involved? To apply for Membership you must be at least 18 years with a permanent home address in the United Kingdom and have a valid e-mail address. Completion of an Application Form and submitting it to us, whether by post or electronically (e.g completing and submitting the on-line application form on our website), will be treated as an offer by you to purchase Membership of Planet Ink Club. We check and verify all Application Forms and we might not accept your application for Membership. Don’t worry, we won’t process any payments until your application has been accepted and we will tell you if your application has been declined. The Application Form asks you to provide details of a credit or debit card in your name. These details will be used by us in order to verify your name and address and will not be used to take payment unless you have chosen to make payment of your Membership Fee(s) by this means of payment or unless we notify you in accordance with these Conditions (see below). When your application has been accepted we will send you a Membership Confirmation either by post or electronically. A contract comprising these Conditions, your Application Form and the Membership Confirmation is made between you and Total Care and becomes legally binding when you receive the Membership Confirmation. What does Membership of Total Ink Club involve? As a Member of Planet Ink Club we will refill Used Cartridges received from you during the currency of your Membership and supply you with Ink that is compatible with your Printer(s). (3)	From the drop down menu select the cartridge type and quantity that you wish to return. If we have supplied you with Package(s) but you chose not to use them we will not be liable for any costs you incur in returning empty cartridges to us. Total Care will only refill Used Cartridges and supply Ink that is compatible with the Printer(s) you have registered with us in accordance with these Conditions. Our aim is to provide supply Ink within 7 days of receipt of Used Cartridges, although this is not guaranteed as these timescales may be affected by matters outside of our reasonable control. We will only send Ink to your Postal Address. We cannot guarantee that the same Used Cartridges you sent to us will be returned to you, re-filled, when we supply Ink, as the administrative burden doing so is too great. However as part of our commitment to the environment we seek to re-use as many Used Cartridges as possible when supplying Ink to Members of Planet Ink Club. When you send Used Cartridges to us you agree that title and ownership in the Used Cartridges passes to us when we receive them. Risk of loss/or damage to Ink will pass to you when the Ink is despatched to your Postal Address. Ownership and title in Ink supplied by us will only pass to you when delivered to your Postal Address. 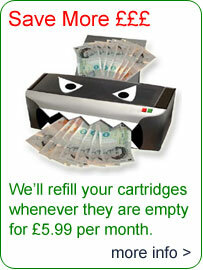 We will provide you with sufficient Packages to return Ink or Used Cartridges to us. We will not be under any obligation to provide you with replacement Packages in the event that you lose them or they are damaged or destroyed and reserve the right to levy a small charge for replacement Packages. Our refill service is subject to fair use and we reserve the right to refuse to supply in excess of 12 sets of Ink for each registered Printer in any 12-month period. Our fair use policy is intended to prevent abuse of the service and encourage responsible printing and you acknowledge that it is fair and reasonable. Details of the quantity of Ink supplied to you as part of your Membership can be obtained from your Account or by contacting us by ‘phone. How many Printers can I registered? Depending upon your membership package, you can registered up to three (3) Printers. What if I change my Printer(s)? If you change your Printer or Printers during the period of your Membership simply notify us by logging onto your Account through the “My Account” area of our Website or by contacting Customer Support by ‘phone or in writing. Your notification will be treated as an offer to vary the terms of your Membership. Before accepting your offer we need to be sure that we can meet our obligations under these Conditions in respect of the new printer. We therefore reserve the right to decline offers in respect of printers, which, in our opinion, we are unable to support or supply Ink for. If we reject your offer, you may cancel your Membership. If we accept your offer, the terms of your Membership will be varied to include your new printer in place of your old printer. You can only notify a change of Printer once in any 12-month period. You will promptly notify us of any changes to the information and/or details contained in your Application Form either by writing to us or by logging onto your Account through the “Members Login” page of our Website. When notifying changes you agree to provide us with such information as we may reasonably request in order to verify your amended or new details. When returning Ink or Used Cartridges you will use the Packages. Properly caring for your Printer is important. You agree that you will operate your Printer in accordance with the manufacturer’s instructions and carry out any routine day-to-day maintenance that may be recommended. You will make payments to us in accordance with these Conditions – see the “Payment” section. What does the Printer Warranty cover? We warrant that your Printer(s) will be free from material faults and defects subject to certain conditions and exceptions as set out below. Should your Printer develop a fault during normal working use which is covered by this warranty we will repair or, at our option, replace the faulty Printer within a reasonable time. What constitutes a reasonable time will depend on the circumstances and/or the nature of the fault in question and, for example, the availability of spare parts. If in our opinion it is not practical, possible or economically viable for us to repair your Printer we will replace it with a printer of equal or higher specification. Any replacement printer will be new or reconditioned to an equivalent standard. Any replacement Printer will be covered by the warranty for the duration of your Membership. We will not charge for carriage costs associated with collecting or returning Printers unless your Postal Address is in the Scottish Highlands, in which case we reserve the right to make a small delivery charge to cover additional carriage costs. We will only make collections from and deliveries to the Postal Address. What is NOT covered by the Printer warranty? Cosmetic damage or any damage that does not affect the operation of your Printer. TOTAL CARE’S TOTAL LIABILITY UNDER THIS WARRANTY SHALL NOT EXCEED £200 IN RESPECT OF ONE OR A SERIES OF CONNECTED CLAIMS. In the event that your Printer requires a repair that is not covered by the warranty, we will be happy to undertake the required repair subject to payment of an additional charge, which we will agree with you beforehand. How do I make a claim under the warranty? Simply call the technical hotline number on your [membership certificate?] to receive technical support. Calls to this number will be charged at [insert rate] per minute. Our technical advisors will seek to diagnose and resolve any fault with you over the ‘phone. If a fault covered by the warranty is diagnosed by us, which is not capable resolution over the ‘phone, we will arrange to collect the Printer and issue you with a unique returns number (“RMA”). This RMA number is important, as it is used by us to track your Printer during the collection, repair/replacement and returns process. Our systems are unable to track Printers without an RMA number and therefore we cannot arrange collection or accept a Printer from you without first issuing an RMA number. The issuing of an RMA number does not amount to acceptance by us of a warranty claim. Acceptance of warranty claims are subject to inspection of your Printer by one of our technicians at our repair centre. Our collection and delivery times are between 8am and 7pm Monday to Friday. We cannot arrange collections or deliveries outside of these times. We will try to agree with you a mutually convenient time for any collection or delivery of your Printer but collection/delivery times are not guaranteed as we are in the hands of third party couriers and the uncertainties of road travel generally. The warranty lasts for the duration of your Membership. If your Membership is cancelled, for whatever reason, the warranty will immediately cease and you will not be able to make any claim under the warranty. What are your obligations under these Conditions? You will co-operate with our staff and do all that you reasonably can to keep our costs to a minimum. You will not send any Printer to us unless we issue you with an RMA number. You will make your Printer available for collection by us at the Postal Address. Prior to collection of your Printer for repair and/or replacement under the warranty you should make sure that all paper, printer cartridges, printer leads and cables together with any storage media (e.g. memory sticks, digital camera media etc) are removed from the Printer. We cannot accept liability in the event that any such items are lost or damaged (or data stored on such items is lost or damaged). Should you send any of these items to us with your Printer you do so at your own risk. You will make sure that your Printer is appropriately packaged (both externally and internally) before it is collected to minimise the risk of damage in transit. Ideally you should use the packaging that the Printer came in when new. If this is no longer available please contact us for advice on appropriate packaging to be used. You will make sure that the RMA number is clearly marked on the external packaging of the Printer before it is collected by us. How and when do I pay for my Membership and Ink purchased? Membership Fees are payable monthly in advance or as otherwise stated in the Order Confirmation. You are required to pay your first month’s Membership Fee by credit or debit card. In the event that you elect to make payments due under these Conditions by direct debit and fail to do so you agree that we can take payment using the credit/debit card details provided in your Application Form. We will advise you before taking payment by this method. We reserve the right to use a third party as our agent for the collection of payments due under your Membership, including direct debit payments. You may cancel your Membership at any time within the fourteen (14) day period starting on the date of the Membership Confirmation (“the Cooling Off Period”). However, your right to cancel will be lost if we perform services at your request during the Cooling Off Period e.g. supplying Ink. If you wish to cancel during the Cooling Off Period you must inform us in writing within the Cooling Off Period by e-mailing us at cs@planetinkclub.com or writing to us at Planet Ink Club (Cancellations), Time Technology Park, Blackburn Road, Simonstone, Lancashire BB12 7TW. Upon receipt of your notice we will cancel your Membership and within thirty (30) days refund any Membership Fees you have paid. After the Cooling Off Period expires you may cancel your Membership at any time on or after the expiry of the Minimum Term by giving us not less thirty (30 days) prior notice in writing by e-mailing us at cs@planetinkclub.com or writing to us at Planet Ink Club (Cancellations), Time Technology Park, Blackburn Road, Simonstone, Lancashire BB12 7TW. If we are in breach of these Conditions you may cancel your Membership if we fail to remedy our breach within fourteen (14) days of being required by you to do so. We may cancel your Membership at any time by giving you not less than seven (7) days prior written notice to the Postal Address or the e-mail address stated on your Application Form. The information provided by you in connection with your Membership application and as part of your Membership will be handled in accordance with all applicable laws and regulations. When applying for Membership you agree that we can give your details to credit reference agencies who will supply us with credit information about you. These agencies may record details of our enquiry and their reply. We may also pass details of how you manage account with us to those agencies. Credit searches and other information which is provided to us and/or the credit reference agency about you and those with whom you are linked financially may be used by others in making credit decisions about you or other members of your household. You have a right of access to your personal records held by credit of fraud agencies and if we have passed any of your details to such agencies we will supply you with their names and addressed upon request. We may pass your details to an external debt collection agency for the purposes of recovering any sums that you may owe us under these Conditions. We will use the information that you supply to us to allow personalised access to the Membership services and for the performance of our obligations under these Conditions. We may also use your information to determine the demographics and statistics of our members, the objective being to provide a better and more targeted service. This information will be used for our own internal business purposes and will not be passed to anyone else except for the purposes of performing our obligations under these Conditions. From time to time we may locate our call centre operations outside the United Kingdom or use third party call centres located outside the United Kingdom and you agree to us passing your information outside of the UK for this purpose. Statistics complied using information you have provided may be shared with others but these statistics will not identify individuals. Otherwise than in accordance with these Conditions your e-mail address will not be released sold or distributed to any third party other than our associated companies. From time to time we may write to you (by post or e-mail) in connection with your Membership or to advertise any new products, services or special offers we think you may be interested in. You will be given the opportunity to “opt out” if you do not wish to receive any further marketing communications from us. We may record or monitor telephone calls with you for quality and training purposes. We do not seek to exclude liability for death of personal injury resulting from our negligence. We will be liable to you for any direct physical damage to your property to the extent that it results from our negligence up to a maximum of £250,000 in respect of one or a series of related events. Unless caused by our negligence, we will not be liable to you for any loss or damage that you suffer as a result of incomplete or incorrect details on your Application Form. In all other cases our liability to you in respect of any direct loss suffered by you by reason of our breach of these Conditions and/or negligence shall not exceed the current replacement value of the Printer(s) covered by this agreement in respect of any one event or series of related events. We will not in any event be liable for any loss or damage arising out of or in connection with your Membership and the provision of products, services or benefits that was not within contemplation of you and Total Care at the time this agreement was entered into. The services and products we provide as part of your Membership are exclusively for personal use and may not be used for business or commercial use without our express prior written consent. If you use any part of the Membership services or products for business purposes you agree that you do so without any conditions, guarantees or warranties, whether express or implied including but not limited to any warranties or conditions as to satisfactory quality or fitness for a particular purpose, which are hereby expressly excluded to the maximum extent permitted by law. If you are a business user, we will not be liable to you for and hereby exclude all liability for consequential and indirect losses and any loss of profit, business opportunity, goodwill, reputation, revenue or anticipated savings, wasted expenditure or loss of data suffered by you whether in contract, tort (including negligence or otherwise) and whether or not such losses were foreseeable at the time this agreement was entered into. Any particular right that you/we may have under these Conditions will not affect any other right that you/we may have at law or under these Conditions. If either you or we choose not to enforce or rely on any right that you/we may have under these Conditions, you/we will not be prevented from relying upon that right should you/we choose to enforce or rely on it at a later date. If a court or other regulatory body decides that any part of these Conditions is not enforceable, the remaining parts of the Conditions will still apply. These Conditions only give rights to and places obligations upon you and Total Care. No other person or company has any rights under these Conditions or may enforce the Conditions against either you or Total Care. Neither you nor Total Care will be responsible for any failure to carry out our respective obligations under this agreement if the failure is caused by any circumstances that are outside of our control. Unless we agree with you to the contrary, this Agreement and all of our communications relating to it will be in English. The Agreement will be subject to and governed by English law and in the event of a dispute English Courts shall have exclusive jurisdiction.